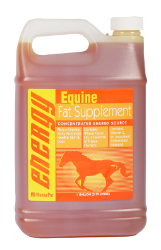 A concentrated energy source that provides energy and weight gain to horses of all ages. Rich in Linoleic Acid, which helps promote a shiny, healthy coat. A blend of 3 oils: Wheat Germ Oil, Soybean Oil, and Corn Oil. Provides Vitamin E, an important anti-oxidant. A great way to add fat to your horse’s diet without increasing their grain intake.